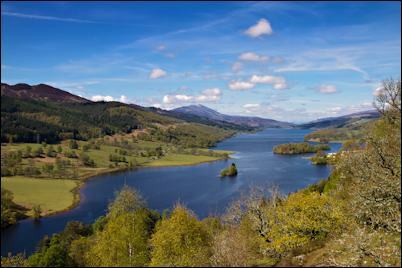 Perthshire is one of Scotland's gems with much to offer. Well known for its beautiful trees and lochs. Ideal for romantic breaks at any time of year. not to mention the pretty towns of Aberfeldy, Pitlochry and Perth. 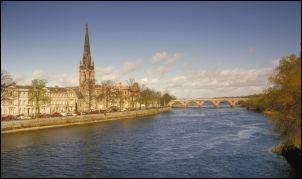 Known as the 'Fair City', Perth was the capital of Scotland in the 12th century. This busy town is home to lots of shops, restaurants and eateries, a concert hall, theatre, swimming pool, racecourse (horse racing), etc. At The Dewar's Centre you can go skating, curling or bowling. Take a stroll along the banks of the Tay (Scotland’s longest river) and see the many bridges of Perth. The Perth Art Trail covers local artists at work in Tay Street, the Fergusson Gallery, and the Perth Museum & Art Gallery (admission free). 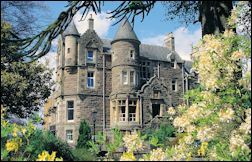 The Black Watch Regimental Museum is housed in historic Balhousie Castle in Hay Street. External link: the history of Perth. There are lots of events throughout the year including the art festival, Perth Show (early August), Perth Highland Games (mid August), flower festival (August). There are regular Farmers' Markets on first Saturday of each month. At the Perth Agricultural Centre you can see livestock auction sales and the Perth Mart Visitor Centre (cafe, gift shop). On the outskirts of town (at the Inveralmond roundabout on the A9) is the Caithness Glass Factory and Visitor Centre (famous for its paperweights). At Bankfoot, 7 miles north of Perth, you will find The Scottish Liqueur Centre and the Perthshire Visitor Centre (gifts, clothing, foodhall, restaurant). Perth has excellent transport links. It sits on the main railway line from Edinburgh to Inverness. There are also regular CityLink coaches from Perth up and down the A9 (linking Edinburgh and Inverness). 2 miles outside of Perth is the historic Scone Palace - where 42 of Scotland's Kings were crowned when it was home to the famous Stone of Destiny. Now home to the Earl and Countess of Mansfield, it is open to the public daily from late March to the end of 31 October. Restaurant, coffee shop, gift shop and food shop. Tel: 01738 552 300. Well worth a visit. Sumptuous interiors full of treasures and history! The large grounds include formal gardens, a wild garden and a replica of the Stone of Scone (on Moot Hill on the site of the original stone which is now in Edinburgh Castle). The Game Conservancy Scottish Fair takes place here every year in early July. Throughout the summer, events including falconry demonstrations and living history performances may be seen at various times. The castle dates from the 13th century and is the ancient seat of the Dukes and Earls of Atholl. Some of ITV’s series 2 of 'Victoria' was filmed at Blair Castle. It has a magnificent setting in 2,500 acres of grounds within an estate of over 145,000 acres. Very convenient location just off the main A9. 35 miles north of Perth. 7 miles north of Pitlochry. Open daily April - October. Guided tours available to groups. Gift shop and restaurant. Tel: 01796 481207. Rated 5 Stars by the Scottish Tourist Board. Click here for more details. 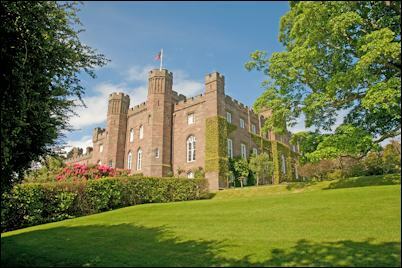 The Castle can be hired for civil and religious weddings and receptions as well as corporate hospitality, private dining and product launches. The Ranger Service provides free information about the waymarked trails for walkers and cyclists on the estate. The Bowmore Blair Castle International Horse Trials & Country Fair take place here every August. Fishing, deer stalking and grouse shooting are available by arrangement. 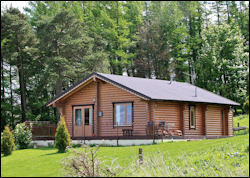 Self catering accommodation is available in Highland lodges. Blair Castle Caravan Park provides holiday homes and pitches for caravans and tents. 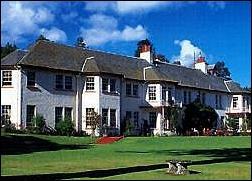 A popular place to stop when driving along the A9 (approximately 10 miles north of Pitlochry) is the House of Bruar. This huge store includes country clothing, knitwear, luxury cashmere garments, a foodhall full of Scottish produce, and a restaurant. Open daily throughout the year. Tel: 01796 483236. This picturesque town is famous for the Pitlochry Festival Theatre which hosts a variety of events all year round. There are lots of hotels, B&Bs and restaurants. On the busy main street you will find Victoria's Restaurant - a family-run eaterie which is open from 10am until late. The Pitlochry Highland Games are on the second Saturday in September. The Enchanted Forest is a magical light and music experience which takes place over 2 weeks in October. 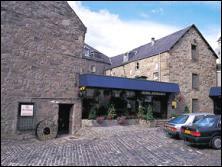 Edradour Distillery is just outside Pitlochry and is known as Scotland's smallest distillery. 3 miles north of Pitlochry is the famously beautiful tree-line gorge called the Pass of Killiecrankie where the first major Jacobite battle took place. It is now in the care of The National Trust for Scotland and a visitor centre is open April - October. Facilities at the Crieff Visitor Centre include a 180-seater licensed restaurant, Caithness Glass visitor gallery and shop, a fully stocked garden centre and a wide selection of quality gift ideas. Open daily from 9am to 5pm. In addition, there is free admission to the Highland Drovers Exhibition (open from 10am to 4.30pm) where you can follow in the footsteps of Scotland's cattle drovers and experience the life and times of the people who made Crieff the crossroads of Scotland at the turn of the 18th century. 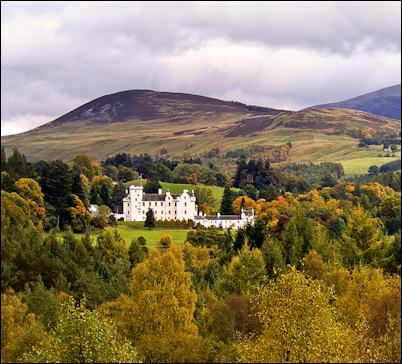 Situated just 20 miles from Perth, Crieff is the second largest town in Perthshire. 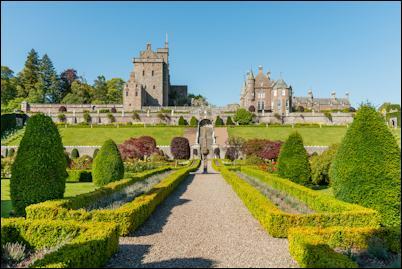 Situated near Crieff, these are Scotland’s most impressive formal gardens, dating back to the 17th century. You might recognise the gardens from the Rob Roy movie. Queen Victoria visited in 1842. Open daily for the Easter weekend and then from 1 May to 31 October. Opening times 1pm - 6pm (last admission 5pm), and 11am - 6pm in July and August. Admission charge. Ticket office with cold drinks and ice cream. Wheelchair access. Dogs welcome. Please note that the castle itself is not open to visitors. Tel: 01764 681433. Ancient loch dwellings known as crannogs were typically built some 2,500 years ago throughout Scotland and Ireland. 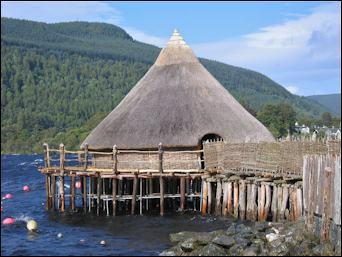 Discover how Iron Age people lived in these homesteads when you visit this unique reconstruction of a crannog which was built by the Scottish Trust for Underwater Archaeology (STUA) at Kenmore on Loch Tay. 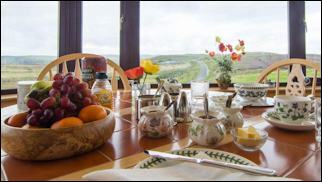 with views across the countryside. Eco-friendly. Near the picturesque village of Glenfarg. Falkland Palace 7 miles. Perth 12 miles. St Andrews 25 miles. Edinburgh and Stirling 40 minutes drive. Riding, walking, loch fishing, castles all nearby. separate shower, sauna and private hot tub. washing machine, hairdryer, central heating, etc. Decked area and patio with furniture & BBQ. includes electricity, bedlinen, and towels. 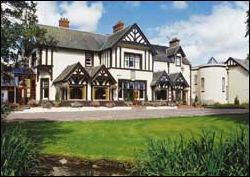 4 star small hotel opened in 2008 after a major refurbishment. Perth's premier Conference and Banqueting Suite. Licenced for civil weddings (maximum 200 guests). Edwardian country house hotel with character and charm. Renowned for high service standards. Set in 6 acres of magnificent landscaped gardens. 2 miles outside Perth city centre. 15 golf courses within an hour’s drive. has a reputation as one of Perth's best restaurants. Guest lounge and cocktail bar. AA 3 stars and 2 red rosettes. Michelin Red Guide and Scotland the Best. trouser press, hairdryer, free WiFi Internet access. a sitting area with sofa bed. Room prices from £27 per person. Former watermill dating back to the 15th century. in the reception and lounge areas. Restaurant serves contemporary bistro food in stylish surroundings. Lounge bar. 24 hour room service. Wi-fi access. hairdryer, trouser press, radio, tea and coffee. Highland Safaris based near Aberfeldy in Perthshire offer guided Land Rover safaris with a kilted ranger to enjoy the wildlife and scenery of Highland Perthshire. This 5 star visitor attraction includes an award-winning cafe and gift shop. Also available: self-guided walking safaris and cycle safaris, as well as Red Deer and Barn Owl encounters, Off Road Driving course, bike hire, plus Scotland's Only Gold and Gem Panning Centre. Activity days can be arranged for stags and hens. Corporate hospitality and teambuilding activities available. Tailor-made celebration packages can include a 5 star dining experience in a hilltop marquee or a picnic in a mountain bothy.